All wood cabinetry offers a classic look that no other material can mimic, but exceptional craftsmanship is required to truly bring out the beauty of solid wood. At Reborn Remodeling Solutions, we adhere to the highest standards of quality and our products are designed and sculpted with your unique needs in mind. Will walk you through our vast Anaheim showroom, showing you samples of our nearly endless combinations of wood species, door styles, glazes, stains, and hardware. Can bring the showroom to you by sending a kitchen designer or bathroom designer to your home to listen to your needs and work with you to formulate a cabinet design plan that embodies exactly what you are looking for. Custom manufacture and hand finish everything for you right here in our state-of-the-art facility in Anaheim, keeping dangerous fumes away from you and your family. Professionally install all of your new cabinetry in your home and ensure that everything is just as you like it. Why stop with just all wood cabinetry, though? 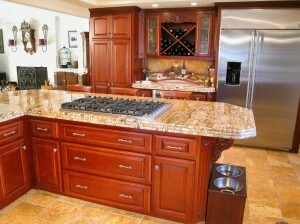 Why not completely remodel your kitchen, bathroom, or another room in your home to complement the cabinets? Team Reborn is actually a full-service home remodeling contractor, licensed, bonded, and insured for work in California. We can transform any room in your home into the room you’ve always wanted it to be and provide the level of quality and dedication that only a family-owned and -operated company can offer. For more on the all wood cabinetry from Reborn Remodeling Solutions, please call us at 1-877-371-4943 or stop by our 40,000-square-foot showroom and manufacturing facility today. We are proud to install our solid wood cabinets in Orange, Los Angeles, Riverside, and San Bernardino Counties, including Laguna Niguel, Mission Viejo, Santa Ana, Fountain Valley, Huntington Beach, Placentia, Yorba Linda, Brea, and all across Southern California. "Tony did an excellent job installing my shower. Would recommend Reborn to my friends & family."